I should probably point out that I don't make different meals for my children; we always eat the same supper. The children and I ate this one evening when Rob was out for the night, which was good timing as the teriyaki sauce I had made wasn't enough so I added a sachet of black bean stirfry sauce which contains gluten. I served it with egg-fried brown rice and quinoa and Lily requested green beans, tenderstem broccoli and asparagus. The same as last week, but this one contained butternut squash and sweet potato. It made a pretty awesome soup for lunches too. I was going to make five-spice cod but I decided that we hadn't eaten fish fingers in a while, so I made a batch using gluten free breadcrumbs and cod loin. Since the five-spice cod was on the meal plan, the accompaniments remained the same but were a bit unusual. Enjoyed none the less. I had initially planned on making a buckwheat based risotto, however Ocado had sold out and our local smaller Sainsbury's didn't stock it so I used regular arborio risotto rice instead combined with green peppers and pancetta. I also stirred through a tablespoon and a half of vegetarian parmesan cheese to test the low-lactose but I won't be using it again as Rob felt itchy. I did let him know what I had added so maybe the effects manifested at that point and perhaps next time I will be sneaky, just to have a final try. On Sunday we had sausages, for me and the kids it was the first time in quite a while! Lily and Alexander had potato smiles, whilst Rob and I had quinoa. Highly requested by Rob, this was quickly rustled up on Saturday evening. Served with edamame stir fried vegetables and egg-fried brown rice and quinoa. 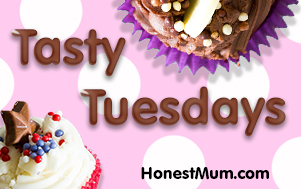 Thanks for reading my Tasty Tuesdays post. Please take a look at all the other recipes and inspiration, it will definitely make you feel hungry! If you haven't read my meal plan for the week, take a look here. Thanks for reading.